Developer: Nintendo EAD Group No. 1. 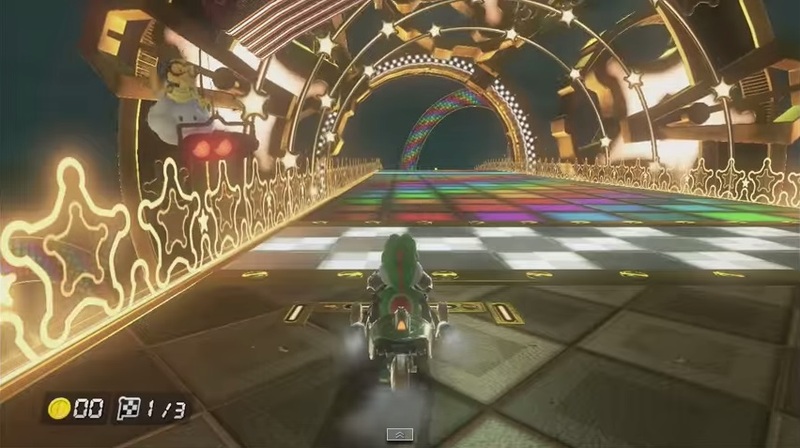 Let’s get things perfectly straight: Nintendo have not significantly altered the Mario Kart paradigm here. They haven’t taken the series in a wild new direction, so everything that is familiar remains, but what they have done is dramatically enhance which was already a winning formula. New additions to the previous MK7, such as underwater driving and gliding have made their way back into the fold, and also the welcome re-introduction of the coins which work in the same way as the original Super Mario Kart. The most obvious and exciting change is the new insertion of anti-gravity racing. This gives the course designers licence to really go wild with the track layouts, so now we have corkscrews, loops, wall and ceiling riding and vertical hairpins. To keep things fair, anti-grav is only activated in certain areas after running over the blue gravity strips. 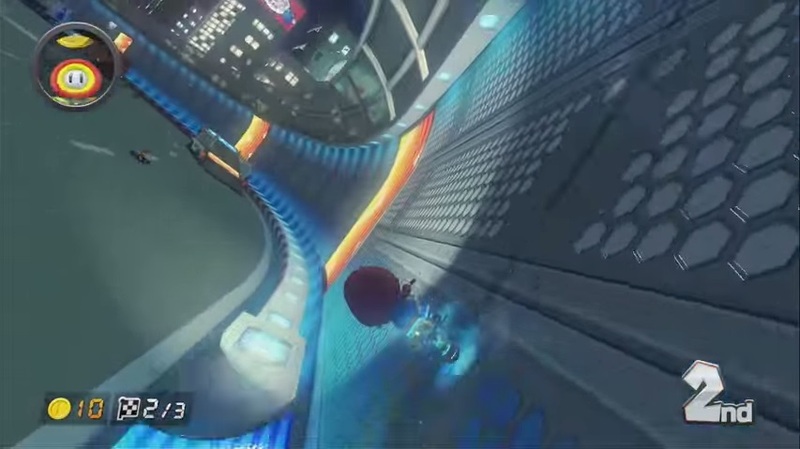 This prevents racers from using the anti-grav abilities all of the time, and also gives tactical advantages to the player who makes the right, or brave choices during the race. In addition to this, there are several new weapons in keeping with the slapstick nature, such as the boomerang flower, piranha plant and the extremely useful super horn, which can now fend off the dreaded blue shell. 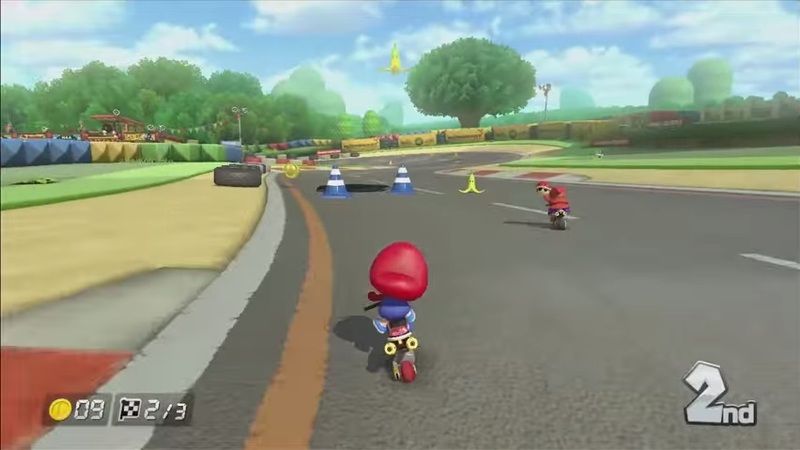 A small change this may seem, but Mario Kart fans will applaud this. All these neat frills may sound very daunting; for example suddenly being upside down mid-race, but clever use of the camera angles simultaneously gives the desired effect but keeps you in control. Often you will not notice you are upside down at all and other times you will find yourself tilting your head as you drive up on to a wall. The balance of the weapons is much fairer too; the large, sometimes aggravating element of luck which was the bane of many Mario Kart Wii players has been trimmed so that skill and quick thought become more vital to success. A return to driving roots if you will. Again without breaking with tradition, the controls are straightforward and user friendly, with many options for your favoured style of racing. The Wii wheel can of course be used, as can the standard Wiimote and Pro Controller. The gamepad can be used both as a standard controller and as a wheel. Clever stuff. Speaking of the gamepad, users will notice that all the race information now appears on the pad’s screen. This take a while to get used to and glancing down at the pad can interrupt the concentration on racing. However, the track map can be put onscreen if you desire. In all these control options is a heightened degree of responsiveness. 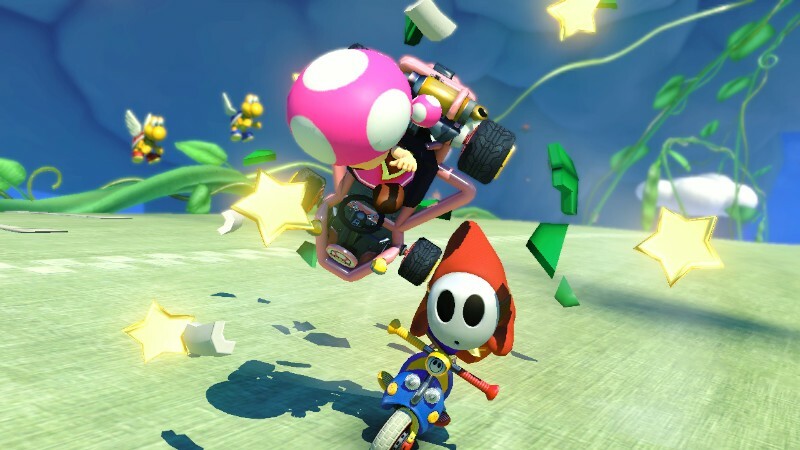 Driving feels more realistic than ever before and the timing of jumps, tricks and weapons is very precise, far more than Mario Kart Wii which is the most similar styled of the previous games. The games modes are also reminiscent of this, with a few minor changes. Online play is more approachable and engrossing, with specific skill level match-ups and private sessions available to customise. Match races can be tailored for great local 4up multiplayer, as can the battle mode. The latter however brings about my only real problem with Mario Kart 8. 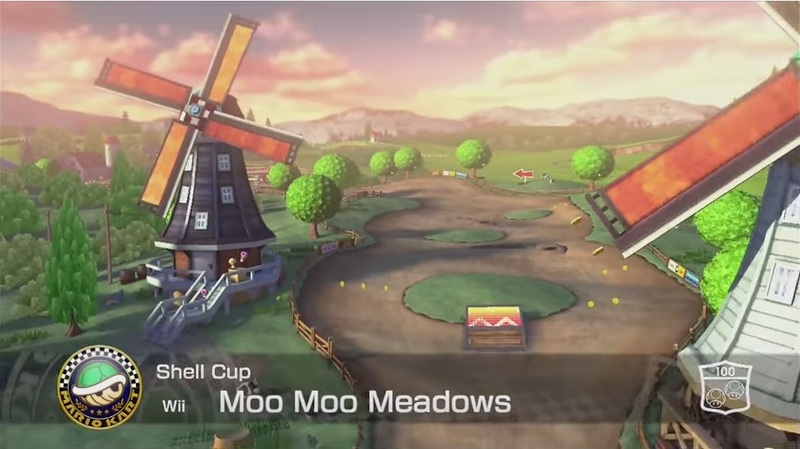 Battles no longer have their own dedicated arena style courses, but just have open play on the regular race tracks. This may have been a good idea on paper, but in practical terms doesn’t feel right. There is way too much waiting and driving around aimlessly, sometimes even missing your opponents completely due to the size of the tracks. It removes that key ingredient of furious battle fun and replaces it with a more tempered, strategic game, which for my money is not for the better. I hope this will be rectified with some future DLC battle courses. …Visuals. If ever any Mario game looked this good, this must set the bar. The menu presentation is simple but exquisitely slick, but it’s the courses that blow your socks off. Impeccably detailed, vast in scope, vivid and imaginative, all rendered as sharp as a tack. It’s exciting to see the each race introduce in the build up, and it all holds together flawlessly during racing. Smooth as you like, fast and sumptuous, it’s joy to play these tracks. Again, small tweaks to the core gameplay have been put in to make to experience even more pleasurable. For example, falling off the track doesn’t loose you as much time as before as Lakitu dives in with the save in ultra quick time, thus not interrupting the play. Characters on the sidelines quip funny movements, the lens flare on the camera and the brilliant touch of the water dripping off your viewpoint all add to make a glorious environment for the action. 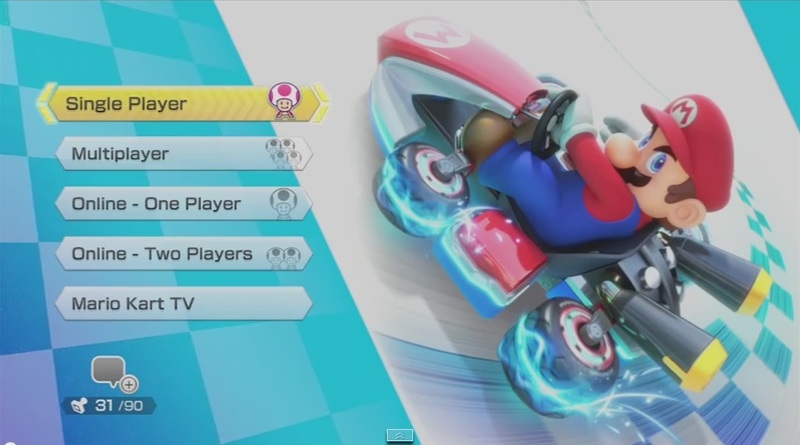 Capping this off is the Mario Kart TV viewer, which lets you record, share and revisit races from a sideline POV. Results can be highly amusing, such as the now viral Luigi death stare. These magnificent images are equally supported by a truly wonderful bespoke soundtrack. All you have to do is listen to the Bowser’s Castle rock-out or the novelty-single catchiness of the Mario Kart Stadium theme. A harmonious marriage of immaculate graphics and quality audio perfectly executed. 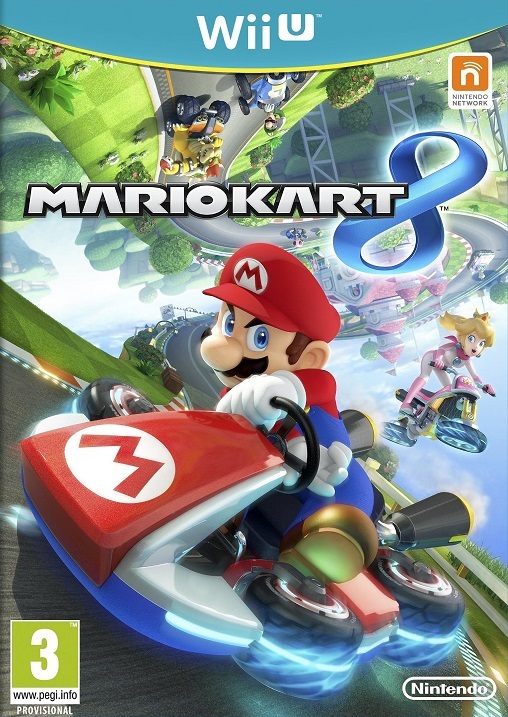 So to answer my first question, is it the best Mario Kart game to date? I would have to say yes indeed sir! With only a single flaw to speak of, everything about this has been very thoughtfully fashioned, scrupulously designed and brought together with care and love. With the added bonus of updates which will possibly remove my battle mode gripe, Mario Kart 8 is an insanely enjoyable title in all aspects. The Mario universe is brought to life like never before, and by not messing with the core recipe, but by merely adding a little seasoning to the mix, Nintendo have brought us another barnstormer. Due to potential updates, it’s not going to get tired quickly even if completing the grand prix mode isn’t the most taxing. The online play will keep it afloat for many years as long as Nintendo clamp down on the hackers, and it will always be welcomed for local sessions with friends and family alike. 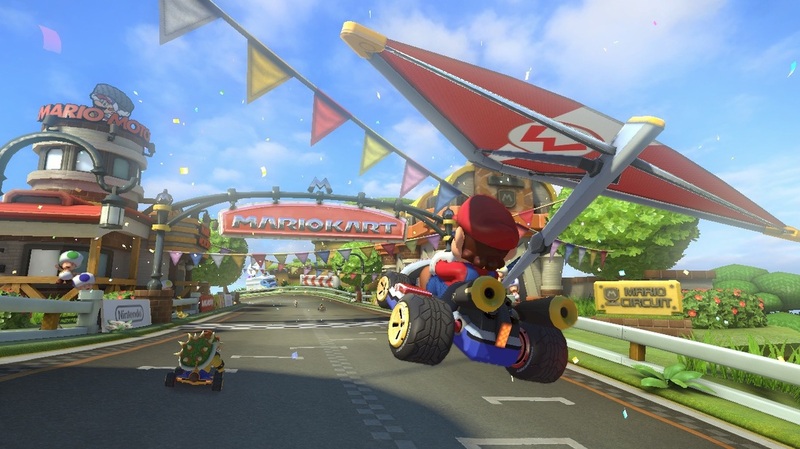 It has the hallmarks of the very first Super Mario Kart; a real future classic standout title and one the Wii U could base its future prospects on. It seems that damn plumber has done it again… Epic.